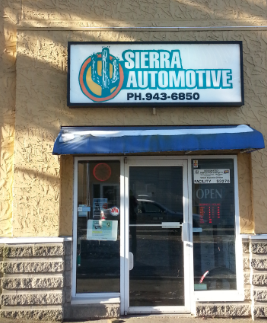 At Sierra Auto, our customers are our No. 1 priority. We understand that it can be unsettling when you are unsure about whether to trust the mechanics working on your car. That is why we will work with you to ensure that a proper diagnosis of your car problem is performed so you know everything is working right when your car leaves our garage. We are committed to maintaining our reputation as one of Tsawwassen’s most reputable car repair shop; we aim to develop lasting relationships with our clients by offering high-quality affordable services and proper advice on how to keep your vehicle’s performance at its optimum. Sierra Auto comprises a team of professional and courteous individuals. Our helpful staff will answer any questions you may have and our mechanics will thoroughly explain your repair options. We perform car maintenance and repair services on all types of vehicles, including gasoline, diesel and hybrid vehicles. All our services are warranty approved and our garage is an approved CVSE inspection facility. Our mechanics have received professional training and are licensed to perform all the auto repair services offered in our shop. Sierra Auto is a member of the Automotive Retailers Association. We are committed to remaining accountable in adhering to the highest industry standards on service delivery. We are the longest-running full-service shop offering auto repair in Tsawwassen. If you are new in town or are a long time resident and require auto services, we can promise that you will enjoy the same level of professionalism that we offer our most valued customers. And you don’t need to worry about the auto service horror stories you’ve heard; we want you to come back and even recommend us to your friends and family, which is why we don’t just focus on that first visit. We are a family-run business, so we offer a level of personalized service that would be impossible in a large repair shop. As such, you get to understand exactly what’s going on with your car. In addition, unlike most large shops and garages, we do not need to charge high rates just to pay our staff since our entire team comprises just five individuals. Sierra Auto is not just about repairing cars; our aim is to build lasting relationships with our clients so they know who to turn to for all their car troubles. We are passionate about cars, so getting your car back in top form gives us a great deal of satisfaction. You no longer have to worry about unreliable mechanics that exaggerate the problem or bring up hidden costs at the last minute. At Sierra, we’ve made it our job to give you the confidence that your car is in the best hands! Give us a call today 604.943.6850!